The Monoblock Pumps introduced by Havells Pump come with easy installation features, greater efficiency and low maintenance cost. The compact shape along with the superior quality of the Monoblock Pumps ensure hassle-free service for agricultural, industrial and commercial sectors. 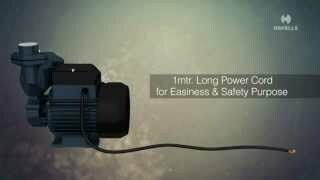 A 1.0 HP high prformance, low energy consumption pump ideal for your home water requirements. An energy efficient motor with an F class insulation, high grade pump casting and a great performance. A compact motor design with a stainless steel pump shaft, the J series is an energy efficient pump from Havells. A high performance pump with dual dual coated H class copper windings and a high suction power. F class insulations giving high discharge in the operating range to boost the efficiency, only with the D series monoblock pump from Havells. With controlled voltage fluctuations, optimal design, high operating efficiency and self-priming capacity, these A Series pumps ensure high-quality experience. With F class insulation and highly energy-efficient motor, these D Series pumps make sure of higher suction power and reliable operating services. Ideal for commercial and residential purposes, the JS Series pumps have durable exterior with productive capacity of pumping out water from underground.